A rising tide of suspicion amplified by social networks has eroded public trust in modern medicine, leaving scientists and health officials scrambling for ways to shore up its credibility, experts say. "The level of confidence is not what it was twenty years ago," French immunologist Alain Fischer told AFP. "It is crumbling." A survey conducted by the British Academy of Medical Sciences last year found that only 37 percent of Britons trusted evidence from medical research. Two-thirds cited friends and family as more reliable. One-in-ten had refused to give their offspring at least one vaccine. In France, meanwhile, more than 40 percent of adults have expressed doubt about vaccine efficacy or safety. Whooping cough, measles and mumps—communicable diseases that had effectively disappeared—have all seen a resurgence in the United States in the last decade because the number of parents refusing to innoculate their toddlers rose above the threshold needed to ensure what scientists call "herd immunity." Similar scandals relating to EpiPens for anaphylaxis and cancer drugs, as well as price gouging, and concerns about the over-prescription of opioids has shaken public confidence in doctors and 'Big Pharma'. In a recent survey in Britain, 82 percent of doctors and 67 percent of adults agreed that clinical trials funded by drug companies were often biased to produce a positive outcome. 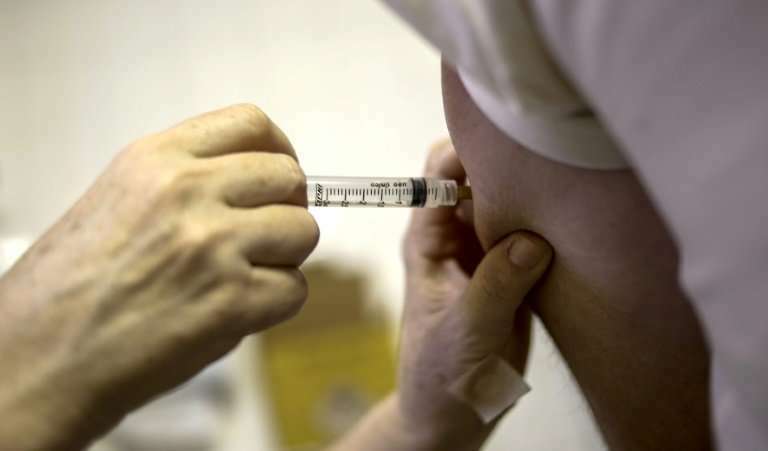 "We no longer see the diseases, just reports about possible side-effects," said Cornelia Betsch, a researcher at the University of Erfurt in Germany who has written extensively about vaccine policy. "That leads us to over-estimate the risks of vaccination, and under-estimate the risks of the diseases." "Injecting septic substances into my body to prevent disease is not a natural idea," he told AFP. "Many children are diagnosed with autism at the age of two—about the same age they get their MMR vaccines," Oliver noted, using the abbreviation for measles, mumps and rubella. Add the "echo chamber" of the internet and social networks, and a perfect storm of mistrust begins to form. "Social media have rapidly become the main information source for many users," said Walter Quattrociocchi, a researcher at the Laboratory of Computational Social Science in Lucca, Italy who has studied the spread of fake news and conspiracy theories. When it comes to conspiracy theories, the tendency to gravitate towards what one already believes—known as "confirmation bias"—plays a crucial role. "Users happily embrace false information as long as it reinforces their preexisting beliefs," Quattrociocchi said. The increasingly blurred boundary between verifiable fact and subjective assertion that defines what some call the "post-truth" era doesn't help. Now President of the United States, he wrote on Twitter then: "Healthy young child goes to doctor, gets pumped with massive shot of many vaccines, doesn't feel good and changes - AUTISM. Many such cases!" He later tweeted that childhood vaccinations were acceptable, but not in "1 massive dose." Too many "leaps" here to address all, but sanitation and re-writing symptoms list for polio changed the world for the better-before the polio vaccine was used nationally. Why has the CDC report on the MMR link to Autism been hidden? See the documentary "Vaxxed" for further explanation. Why do vaccines not confer lifetime immunity? They don't even titer the victims to see if the vaccine "works." The flu shot is total junk and always has been. Why stimulate the immune system at the start of "flu" season when it normally doesn't match the strain present???? Why use aluminum salts to stir the immune system to recognize the vaccine? Aluminum is a poison to humans! Why do people shed virus strands of polio, measles, etc. after receiving the vaccine? Rising rates of above stated diseases in the U.S. are DIRECTLY related to illegal immigration! Most, if not all illegals have no immunizations whatsoever! See the California Measles outbreak at Disneyland. 722857 Good comments. My interest in this subject is due to the fact that I survived, mostly, GBS. It was a life changing event and may have been preventable because I complained about reactions to my annual flu shot for two years prior and was told that the shot had absolutely nothing to do with it. Of course now that permanent damage is done the same doctors will not even consider giving me flu vaccine. Then on a similar vein about two months ago my pet got a vaccination. He was a little older but in good health. He died about 8 hours later. I received a call the next day that his blood work was perfect and I had to inform them of his death. I don't blame the vet, she was doing what she thought best but I have to wonder about the cause and effect. Overall vaccines are a good thing I believe but we have to consider some questions and not be blind to possible problems. Medicine is a business that makes money when you are sick, not when you are well. This creates an implicit conflict of interest between the medical industry and the consumer. As with all businesses, consumer beware! As a medical anthropologist researcher examining the lifestyle causes of disease, I often come up against this medical conflict of interest. Preventing disease is unfortunately in conflict with the detection and treatment of disease. I have personally experienced this dilemma with my research into the link between breast cancer and wearing tight bras. I am the co-author of Dressed to Kill: The Link Between Breast Cancer and Bras. Medical response to this issue over the past 25 years has been vitriolic and obstructive, although numerous studies internationally now support the bra-cancer link, and new bra designs for safer bras cite our research. You would think that a simple lifestyle solution would be welcome by the medical community. It's not when it affects profits. This article is just plain wrong. It says "Dr Andrew Wakefield's study was withdrawn and he was barred from the profession, but the damage was done." In reality, his study was concluded, put out for all to see (Vaxxed, the movie) and he was REINSTATED into the profession because he is 100% absolutely right. Toto has pulled back the curtain, exposing the murderous con artists in big pharma. This article is pretending Toto never pulled back the curtain. Too late! Everyone is already hearing the truth from Dr Andrew Wakefield and Dr Sherry Tenpenny on the Alex Jones Show. Articles like this one are so LOL. What about the millions of 3rd world poor that the US introduced into the country who have never been vaccinated. Many of whom had communicable diseases and no understanding of literacy nor sanitation.. The distrust in medical treatment is a side effect of the distrust is science caused by the climate change scam. All those claims from climate so called scientist that never came true when they were supposed to proved that they were lying. So now all science has a dark cloud over because of the greed in the climate change scam. The reason people distrust medicine is because they are frequently belittled by "healthcare" professionals. If a doctor cannot determine what is wrong with you, he/she tells you it's in your head and/or that your symptoms are due to stress. Or, they just give a prescription to mask the symptoms, which often times have serious side effects of their own. People have been forced to rely on the personal experience of friends and family or use social media to try to heal themselves. Many times they find real answers and solutions by connecting with others who are in the same boat. Those solutions are usually pharmaceutical-free, affordable and highly effective. The public is becoming highly educated about how the medical system operates and is realizing that modern medicine is controlled by the pharmaceutical and insurance companies. With recent genomic discoveries, it is irresponsible to assume everyone will respond to the same vaccine exactly the same and that they'e safe for everyone. IMO, this article comes across as a biased and non-objective "propaganda-piece" promoting vaccines and "standard medicine" and denigrating the views of anyone -- including medical professionals and researchers -- who say that there is legitimate, valid, evidence that says that there are DANGERS to vaccines and to aspects of what's being promoted by "standard medicine". So concerned was I about this piece, that I prepared a point-by-point REVISION of it, and attempted to submit it here as part of my comment. But the comment-system wouldn't let me do it, as the comment-system limits each post to 1,000 characters -- and the REVISION to the article is a touch over 8,100 characters (with spaces). So much for an in-depth science-based discussion here! So my advice: Read this article, including how it takes a pro-vaccines pro-"standard medicine" stand, and including how it EXCLUDES or CASTS ASPERSIONS ON information that might challenge its assertions. And DO THE RESEARCH. PRO, I suggest you submit your message in 9 parts or what ever is necessary, especially if you put a lot of time into writing it. As I stated in an earlier comment, I found what in my opinion are EGREGIOUS FLAWS in the above article, such that I created a proposed REVISION of the article which I hoped to post in its entirety here. But because the Comments-Section imposes a 1,000-character limit, I have now divided my PROPOSED REVISION TO THE ABOVE ARTICLE into a 12-PART SEQUENCE. MY ADDITIONS are in BOLD. A rising tide of suspicion amplified by social networks AND PUBLICLY-ACCESSABLE SCIENCE-BASED RESOURCES has eroded public trust in modern medicine, leaving scientists and health officials scrambling for ways to shore up its credibility AND PRO-VACCINES PROPAGANDA, experts say. Especially in rich nations, faith has waned in vaccines that have (a) ALLEGEDLY saved millions from the ravages of polio, tetanus, small pox, influenza and many other once rampant and deadly diseases AND (b) ALSO ALLEGEDLY CAUSED SEVERE AND LONG-LASTING HEALTH-INJURIES, DISABILITIES, AND DEATHS. The scale of scepticism is startling BUT NOT UNEXPECTED. A survey conducted by the British Academy of Medical Sciences last year found that only 37 percent of Britons trusted evidence from medical research. Two-thirds cited friends and family as more reliable. WHETHER THE SURVEY ALSO QUESTIONED PEOPLE IF THEY HAD RESEARCHED THE SCIENTIFIC EVIDENCE PRO-AND-CON REGARDING MEDICAL RESEARCH IS NOT REPORTED. A quarter of 1,500 parents polled in the United States in 2017 believed that vaccines can cause autism in healthy children, despite a complete lack of credible evidence CITING AN ABUNDANCE OF ALLEGED (YET CONTROVERSIAL) EVIDENCE IN SUPPORT OF THAT CLAIM. Whooping cough, measles and mumps—communicable diseases that had effectively disappeared AND ACCORDING TO HISTORICAL RECORDS, WERE ALREADY SUBSTANTIALLY ON THE WANE BEFORE THE ONSET OF WIDESPREAD MASS-VACCINATIONS — have all seen a resurgence in the United States in the last decade EITHER (a) ALLEGEDLY because the number of parents refusing to innoculate their toddlers rose above the threshold needed to ensure what scientists call "herd immunity" OR (b) ALLEGEDLY DIRECTLY BECAUSE OF THE VACCINES THEMSELVES. In France, health authorities FELT THAT THEY were forced to take action TO SUPPORT THE CLAIMS THAT VACCINES (AND PROTECTION OF "BIG PHARMA" MEDICINE) WERE NECESSARY TO PROTECT SOCIETY: as of this year, any child that has not been vaccinated for 11 specific diseases will not be admitted to kindergarten or school. Most damaging, perhaps, are a series of scandals involving inadequately vetted drugs AND VACCINES, poor oversight by health officials, and attempted cover-ups – ALSO INCLUDING COVERUPS OF SCIENTIFIC RESEARCH. THAT RUNS COUNTER TO THE OVERALL PRO-PHARMACEUTICAL AND PRO-VACCINE POSITION. When it was later CLAIMED that evidence underlying this claim had been falsified –- EVEN THOUGH THAT CLAIM WAS DISPUTED --, the study was withdrawn and its author Andrew Wakefield barred from the profession BUT ACCORDING TO SEVERAL ACCOUNTS HAS SINCE THEN BEEN EXONERATED). But the damage (TO UNSWERVING TRUST IN VACCINES – AND TO WAKEFIELD) was done. Vaccines and other medicines are also a victim of their ALLEGED success AND THEIR ALLEGED DANGERS. "Injecting septic substances into my body to prevent disease is not a natural idea," he told AFP. NOR, CRITICS SAY, IS IT NECESSARILY A GOOD IDEA EITHER. IS THE PERCEIVED LINK SPURIOUS – OR IS THE PERCEIVED LINK VALID? "Many children are diagnosed with autism at the age of two—about the same age get their MMR vaccines," Oliver noted, using the abbreviation for measles, mumps and rubella. BUT WHAT OLIVER EXCLUDED FROM THAT STATEMENT WAS THAT THE DIAGNOSED ONSET OF AUTISM TYPICALLY STARTED SHORTLY AFTER THE CHILDREN HAD BEEN INJECTED WITH THE MMR VACCINE. Add the "echo chamber" of the internet and social networks AND ALTERNATIVE SOURCES OF INFORMATION ABOUT RESEARCH ABOUT MEDICAL CLAIMS, VACCINES, AND THE POLITICS OF "BIG MEDICINE", and a perfect storm of mistrust begins to form. "Social media have rapidly become the main information source for many users," said Walter Quattrociocchi, a researcher at the Laboratory of Computational Social Science in Lucca, Italy who has studied the spread of fake news and conspiracy theories. WHAT QUATTROCIOCCHI EXCLUDED FROM THAT VIEW IS THAT IT IS NOT ONLY "SOCIAL MEDIA" BUT IS ALSO "ALTERNATIVE RESEARCH SOURCES" THAT HAVE BECOME ADDITIONAL INFORMATION SOURCES FOR MANY USERS. WHAT QUATTROCIOCCHI FAILED TO CLARIFY, IN THAT STATEMENT, IS THE FACT THAT THE SAME PRINICPLE ALSO APPLIES TO THOSE PERSONS (OR INTERESTS) WHO WANT TO GENERATE AND PROPAGATE THEIR OWN SELF-REINFORCING VIEWPOINTS. The increasingly blurred boundary between verifiable fact and subjective assertion that defines what some call the "post-truth" era – AND WHAT SOME OTHERS CALL "THE ERA OF THE BREAKING-THROUGH-OF-THE-TRUTH" – IS SIMULTANEOUSLY A HINDRANCE AND AN ADVANCE, IN THE SEARCH FOR "TRUTH". SO WHAT IS QUATTROCIOCCHI IMPLYING? THAT TRUMP IS INCONSISTENT ABOUT VACCINES BEING GIVEN IN MULTIPLE DOSES OVER TOO-SHORT A TIME? OR THAT TRUMP'S TWEETS PROVE THAT ANY EVIDENCE OF VACCINES BEING POSSIBLY DANGEROUS IS FALSE? Il ne s'agit pas de rétablir la confiance des usagers mais de rétablir l'honnêteté des fournisseurs.